The master’s program in Communication Disorders and Sciences (CDS) prepares you to become a nationally certified speech-language pathologist. A speech-language pathologist is a professional specializing in the prevention, identification, and treatment of communication disorders. Speech-language pathologists are employed in a variety of settings including schools, hospitals, and private practice. The CDS program at SIUC is accredited by the Council of Academic Accreditation in Audiology and Speech-Language Pathology (CAA), part of the American Speech-Language Hearing Association (ASHA). Our rigorous master’s program is designed to be a five semester program including two semesters of clinical internship. Our students excel at passing the Praxis exam, a national exam necessary for ASHA certification, and have very high job placement. We promote collaboration between our faculty and students enabling students to actively engage with faculty through clinical, research, and mentorship experiences. Please choose a link below to learn more about the CDS program at SIUC. How to become a CDS graduate student (application process). Cost (graduate tuition and fees, financial aid, graduate assistantships, scholarships). Courses required to complete a master's degree in CDS (i.e., the curriculum). (A) SIUC Graduate School Application. You must complete this application online (Apply Yourself) which can be accessed through the Graduate School website. Admission is contingent on Graduate School approval. International undergraduate transcripts will be evaluated by university admissions. Only four links necessary to complete Graduate School Application: Personal Data, Program Information, Previous Colleges, and Public Safety Questions. Not necessary to upload resume, letters of recommendation, transcripts for Graduate School Application. If you wish to be considered for a graduate assistantship, access Admissions link and follow instructions on the Application for Graduate Assistantship form. The SIUC CDS program admits graduate students once a year. If the date falls on a weekend then the due date is the following Monday. Due Date: Applications for Fall admission are due to CSDCAS and the SIUC Graduate School on January 15th. Prerequisites: Completion of bachelor's degree. Applicants who have not completed the typical undergraduate CDS course work may contact the program for more information about completing the prerequisite courses before applying to the program. 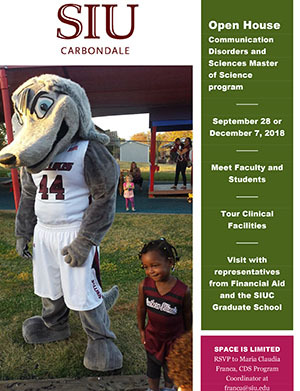 Mailing address for CDS Graduate Program: SIUC, Rehabilitation Institute - Mailcode 4609, Rehn Hall, Rm 308, 1025 Lincoln Drive, Carbondale, IL 62901. If questions, you may contact the CDS Program Coordinator. (B) SIUC CSDCAS Application. In addition to the Graduate School Application, you must also complete a CSDCAS application. You are directed to the CSDCAS website at CSDCAS website. The deadline for application to the SIUC graduate program is January 15th. Please read the instructions and FAQs provided at the CSDCAS website carefully. (C) Application fee. Please pay the $65 Application Fee on the Apply Yourself site for the SIUC Graduate School Application by credit card only. If an applicant wishes to request a fee waiver, please contact the CDS Graduate Program directly. Applicants should follow the instructions on the CSDCAS website regarding a separate application fee to CSDCAS. Applicants interested in applying for a fee waiver through CSDCAS should carefully read the instructions for fee waivers provided on the CSDCAS website. (D) Minimum 2.7 GPA on a 4.0 scale for the previous 45 or 60 semester credit hours. (E) The Graduate Record Examination (GRE) is required by the CDS program. Students should submit scores directly to CSDCAS by selecting the GRE Code 0038 for SIU Carbondale. (F) Letters of recommendation/reference – will be uploaded directly to CSDCAS. Follow CSDCAS instructions on inputting contact information for those who will provide letters of recommendation for you. (G) Additional information- will be uploaded directly to CSDCAS. Follow CSDCAS instructions. Applications that are incomplete as of the due date may not be considered. a. Evidence of volunteer, shadowing, or paid experience if those experiences involved persons with communication disorders or other disorders. b. Applicants who have engaged in professional extra-curricular activities, such as pre-professional organizations (e.g. NSSHLA). c. Professionally recognized products such as a conference presentation, a research presentation, an article in a peer-reviewed journal, or a grant application. d. Something professional in nature that you do that indicates to the panel that you are self-motivated, not just meeting standard academic requirements. These experiences usually result in applicants developing more contact with particular faculty, which they may then use as a strong reference. The Admissions Committee does not expect perfection in all areas, but to only consistently meet, rather than exceed - requirements may not make one stand out above other applicants. Requests for financial assistance will not alter an applicant's chances for admittance. Several rounds of selection may occur, so applicants who are not selected in an earlier round may be selected later; they should not give up or drop out. How much will it cost (graduate tuition and fees, financial aid, graduate assistantships, scholarships)? Morris Library. This is the main campus library. Contact the Morris Library Personnel Director at 618-453-2681. Disability Support Services. An office on campus that provides a variety of services to students with disabilities. Phone: 618-453-5738. Evaluation and Developmental Center (EDC). A program that is connected with the Rehabilitation Institute. Phone: 618-453-2331. Achieve Program. A program that provides services to SIUC students with learning disabilities. Phone: 618-453-2595. Student Recreation Center. The hours of operation for the SIUC Intramural-Recreational Sports Administrative Office are Monday through Friday 8:00am-4:30pm. No appointment is necessary. Phone: 618-536-5531.